So, if you're not already aware, it is DAR Midwest Week. Now, of course, we started the week essentially in Detroit and it seems as if we shall stay in that area as we talk the dominate performance the Pistons had in the 1990 Finals against the vastly improved Trailblazers. Now, for the Blazers, it had been a long road to get back to being close to prominent. After making some good trades and draft picks, they found themselves back in the Finals for the first time since winning in 1977. Now, the Pistons were the defending champions and Chuck Daly was looking to add yet another title to his resume. We were still in the Bad Boys era and the Pistons were hell for Michael Jordan and the Bulls before the Bulls dynasty began and pretty much the strongest Eastern Conference team of the late 80s. The Celtics would easily be the strongest Eastern Conference team in the early-mid 80s, but the late 80s were all the Pistons. For Rick Adelman and the Blazers, there stood a significant challenge, but if anyone would be able to handle it, you would think the Blazers would be up to the challenge. After a successful run in the playoffs defeating the Mavericks, Spurs and the Suns, the Blazers were set to go for the NBA Finals. For the Pistons? It was an interesting path as they swept the Pacers, defeated the Knicks in 5, before coming up against a hungry and ready Chicago Bulls team. The Bulls would push them to the limit, going 7 games and almost defeating them, but the Pistons would pull out a win yet again. It would be the third season in a row that the Pistons beat the Bulls in the playoffs. For the Pistons, they had a chance to make history. For the Blazers, they had a chance to restore championship glory. As game 1 approached, there was a buzz in the air. -This game would be a back and forth contest between both teams and would see the Blazers up by 10 with less than 7 minutes left in the 4th quarter, but the Pistons could not be counted out. Joe Dumars and Isiah Thomas would lead a change to bring the Pistons back within 3 and eventually Thomas would score seven straight points to give the Pistons the lead. He hit a final 3 pointer to give the Pistons a 5 point lead and they would go to win the game 105-99 to take a 1-0 series lead. Buck Williams would lead the Blazers in rebounds with 12, while Bill Laimbeer would lead the Pistons in rebounds with 15. 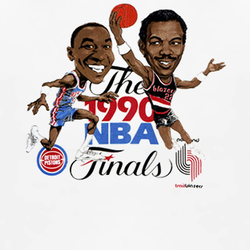 Isiah would be the leading scorer for the Pistons with 31 points and 6 assists while Drexler would put up 21 points for the Blazers. Going into game 2, the Blazers would need to pull out the stops to win. -The Blazers were playing well on the road and it just seemed as if the championship experience of the Pistons were proving to be too much for them in some ways despite this. Regardless, we watched in game 2 how they managed to control the early portions before watching the Pistons take a 3 point lead in the final seconds before the Blazers tied it up with free throws to go to overtime. In Overtime, both teams would play hard, but an unnecessary foul from Dennis Rodman with just 2 seconds left in OT cost the Pistons the game. 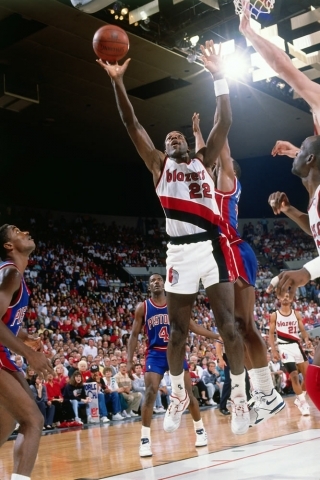 Drexler hit the game winning free throws and Portland would take game 2 106-105 in OT. Drexler would finish with 33 points on the night while Isiah would score a double-double with 23 points and 11 assists. 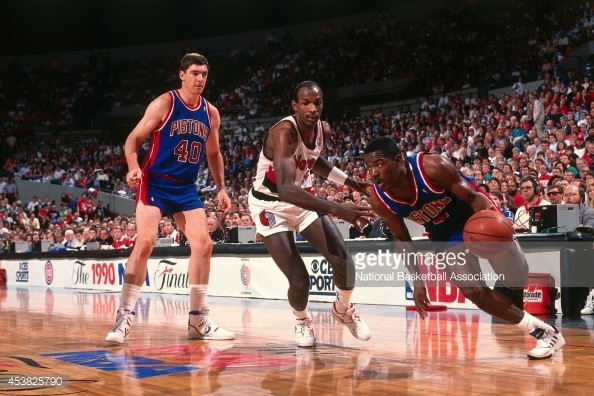 Bill Laimbeer also produced a double-double with 26 points and 11 rebounds but it wasn't enough to pull the Pistons ahead. With the series tied 1-1, we went to Portland for game 3. -Life is strange at times. Joe Dumars was on the verge of losing his father. He knew this was coming. As he went into game 3, he asked his wife not to tell him anything about his father until after the game. Dumars would play his best game of the series here, leading all Pistons scorers with 33 points, as his father passed away about an hour before the game started. While Dumars didn't know for sure that his father had passed before the game, he played as if he knew. He would lead the Pistons to a decisive 121-106 victory and that would be the largest margin of victory in the whole series. Dumars would soon find out about his father after the game and despite the heartbreaking news, he would still go on to play game 4. The Pistons were now up 2-1 and had an opportunity to take a big step in winning a back-to-back championship by securing game 4. Would they be able to do it? -Another close game as the Blazers got out to an early start but couldn't seem to maintain their stance as the Pistons pulled in close and took a lead at halftime. The Pistons would end up winning the game 112-109 to take a 3-1 series lead at this point. The controversy about this game is that Danny Young knocked down a huge 3 pointer just as the game was ending and would have sent the game to overtime. Apparently, Young did not get the shot off in time and the game would end there. 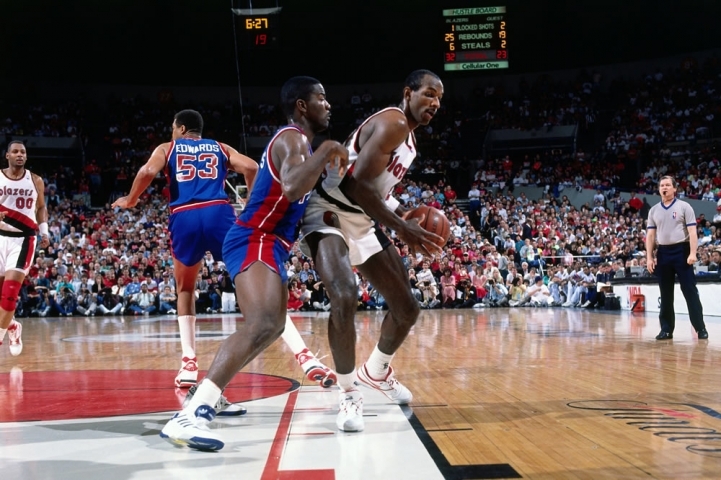 However, Drexler played amazing for the Blazers, pulling out a near triple-double with 34 points, 10 assists and 8 rebounds, while Isiah would once again lead the Pistons, this time with 32 points and 5 assists. As game 5 approached, the Blazers had their backs against the wall. Could they manage to pull out a victory? 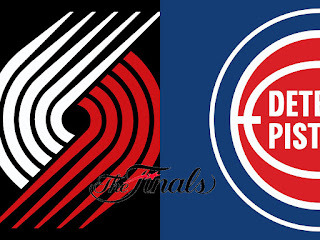 -Another close game here, the Blazers and Pistons took each other to the limit. As the Blazers began taking control of the game in the 2nd half, Vinnie Johnson managed to bring the Pistons back into the game with 9 straight points and subsequently shifted the momentum back into their favor. However, the Blazers would answer right back and take another decent lead. As the Blazers led 90-83 with just 2 minutes left, Vinnie would score an amazing 7 points including the game winning shot, as the Pistons closed out a 9-0 run to win the game and the series. The Pistons would defeat the Blazers 4-1 after their 92-90 victory. 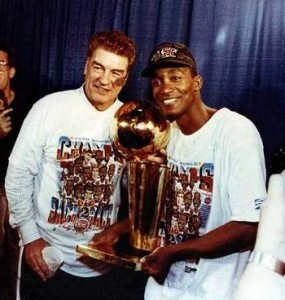 Isiah would finish the night with 29 points and be named the NBA Finals MVP. The Pistons were back-to-back NBA Champions and had made history as only one of a few teams to accomplish that feat. In many ways, this marked the end officially of the Bad Boys and the Pistons era. They would go for a third title the next season and would lose in the Eastern Conference finals to a stronger and smarter Chicago Bulls. As the Pistons run of dominance ended, the Bulls began their run and would end up controlling the NBA for much of the rest of the 90s. However, the Pistons ran the late 80s/1990 and their legacy is forever solidified. This would also mark the end of the run of the NBA on CBS Sports. Marking yet another end of an era. Your 1990 NBA Champions, Detroit Pistons!